Head lice are extremely contagious and thrive on human hair. 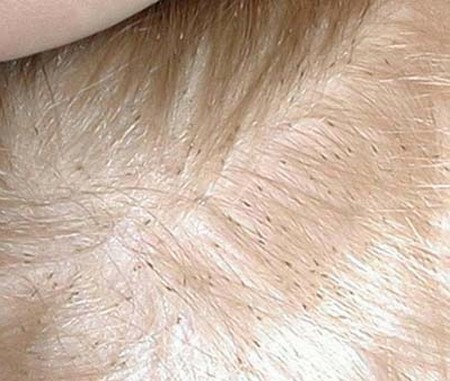 These tiny insects produce eggs that attach to the hair roots and scalp. Lice spread if you share clothes or hair brushes as well as by direct contact with an infected person. If you are suffering from head lice or knows someone who is, here are some tips to remove head lice from your hair. Determine if you or the person has head lice. Symptoms are itching, backs that are swollen, bad-smelling hair and little white-gray spots attached the the hair roots. Look for live head lice. Position yourself in an area where there is bright lighting and separate your hair into sections. You can use a fine comb to comb them out of the hair. You can also use your fingers or tweezers. Head lice do not jump or fly, so it is relatively easy to remove them once you spot them. Once you determine you have head lice, check the remaining members of the household. Head lice are contagious and can spread quickly. Wash all items that come in contact with the effected person, including all the bedding, pillowcases, towels and clothing. Wash them in hot water and dry them under the sun or in a hot dryer. Put warm water in a container and soak all the combs and brushes you used. Leave it for 10 minutes. Put mayonnaise or olive oil in your hair. There are actually testimonials about these food products’ effectiveness in getting rid of head lice. Leave them on your hair as long as necessary. Once you are done, wash your hair with shampoo and blow dry it. Use a blow dryer to dry your hair and also to remove head lice. But be careful not to use it too much, or else you might toast your hair or burn your scalp. Asses your hair every day. If you see a few head lice left, you may need to repeat the previous treatments to get rid of them permanently. Consult a doctor. He may prescribe you a cure that can treat head lice. There are many hair products that target head lice problems. Removing head lice manually is often the most effective method. Do not share your things with someone—especially your brushes, caps, clothing or other things you put on your head. If you are pregnant or nursing a baby, consult with your doctor before undertaking any treatment that involves chemical products. Do not use chemical products on babies unless approved by their doctor.